Gift Ideas for Scouts that won't break the bank? Discussion in 'General Discussion' started by chorpie, Apr 15, 2019. 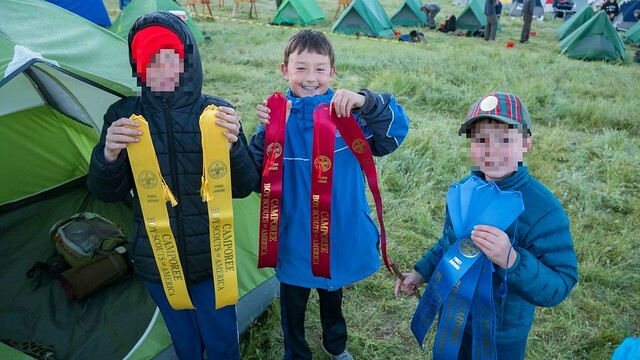 So my Webelos boys attended their first Camporee this last weekend and they totally loved it. I'm going to make them firesteels (they wanted to use this for the fire event but my son was the only one that had used it the week before..), but was thinking about getting them each some gift for when they bridge to Boy Scouts. I was thinking compasses, but I can't afford a bunch of MC-2G's. They didn't want to leave the orienteering challenge. I've got about a year, but was wondering if you guys had suggestions of gifts I could get them that won't bankrupt me? We had one that didn't spend the night, but the four of them rocked it Blurred the faces of kids that aren't mine. 5col and chorpie like this. Cool haversack. You can usually pick up a polish bread bag for around 20. Suunto Clipper compass on a 18mm nylon strap and a pace cord? As a scoutmaster we try to do something from what the boys love. Knives, fire or rope. Buy old pocket knives at an antique or thrift store. A scout is thrifty, scout shops have ferro rod kits, paracord for knots and rank advancement. Every boy needs a Nalgene bottle and camps have them with custom logos, they sell plastic camp mugs etc. Cool. My oldest and Webelos den are crossing over next Feb.
As far as gifts: paracord, used pocket knives, etc. Suunto A10 compass can be had for cheap. I like the ferro rod idea. Our den recently went over some first aid requirements and I made them all small kits that easily fit in a sandwich zip lock bag. It contains the basics for something that would be most likely to pop up on a hike/overnight camp. chorpie and BlueDogScout like this. i would be more than happy, as an ex Brownies, Beavers, Cubs, Scouts, Eagle Scouts, to supply a bunch of Swiss Army knives , possibly more, to a future generation of Scouts. best time ever as a lad, was Brownies, Cubs, Scouts and Eagle Scouts. Drew RedBear, Strigidae, BlueDogScout and 1 other person like this. Firesteels are happening, I just need to buy the handle material. I like the looks of the Suunto A10, anyone have first hand experience with those? I think on the old forums, Jeff or someone said to get an MC-2G and you won't need another one, so I never tried anything else. Sailor’s Palm, needles, and leather-weight thread; a few scraps of canvas and leather. Teach them how to make and repair. Down the road, help them make a butcher’s paper pattern for a possibles bag. Then, each one makes for the other. BlueDogScout and Zeek like this. mors kochanki's book, "bushcraft" or cody lundin's books, "98.6 degrees" or "when all hell breaks loose" (this also comtains the previous book's info)...they are by far by favorite survival skills books. I would chip in and help bushy on this one. Or mora eldris knives. Most scout programs no longer allow fixed blades unless they are under 3” blades. If they don't already have them maybe a fine Arkansas pocket stone or get the group together and make strops,got to keep those tools sharp! Basic headlamps are affordable,you can't have too many. @chorpie PM me. I'm happy to throw some extra discounting your way (beyond the forum discount), and I have some stuff hanging around the shop that I'd be happy to throw in for free. My first thought when I saw this was a discounted Leatherman Squirt multitool, but maybe a loaded Finnish Gas Mask Bag would also be a cool idea. We could bundle the bag with a 1 Qt canteen, some paracord, an AMK emergency blanket, and a rescue whistle. You wouldn't have spent much $$ and you'd still have room to add more stuff. I guess it's just over three decades since I crossed from Webelos into regular scouts, but I still think all the same stuff is cool. Stagehand and Strigidae like this. Man, you guys are all super generous - I really appreciate it! And tons of great ideas too! Yup this is why i shop with 5col. 5col, Stagehand and RedEyedHog like this.